Today I’m sharing with you some of my Falloween decor. Heh, Falloween! These are my transitional decorations that can be used for Halloween and the entire season of Fall, I THINK! I originally saw some adorable little pumpkin topiaries at Home Goods. If I could go on a shopping spree, I would definitely want to spend a large chunk here! Anyway, the pumpkin decorations were about $20 a piece and for the size, I just couldn’t do it. Then it dawned on me – I had pumpkins from the Dollar Tree and could just run back and grab some glass candle stick holders to make basically the same thing, but for much less! Make sure your candle sticks are nice and clean. Then spray with black spray paint. This is also when you’d spray your emptied out candle container. A tip for cleaning – freeze your candle container for about an hour. When you take it out, the leftover wax should have shrank enough and loosened from the sides that it will just fall right out! Then wash. I decided to not stack my candle on top of the sticks. If you want to do this, just attach with hot glue. 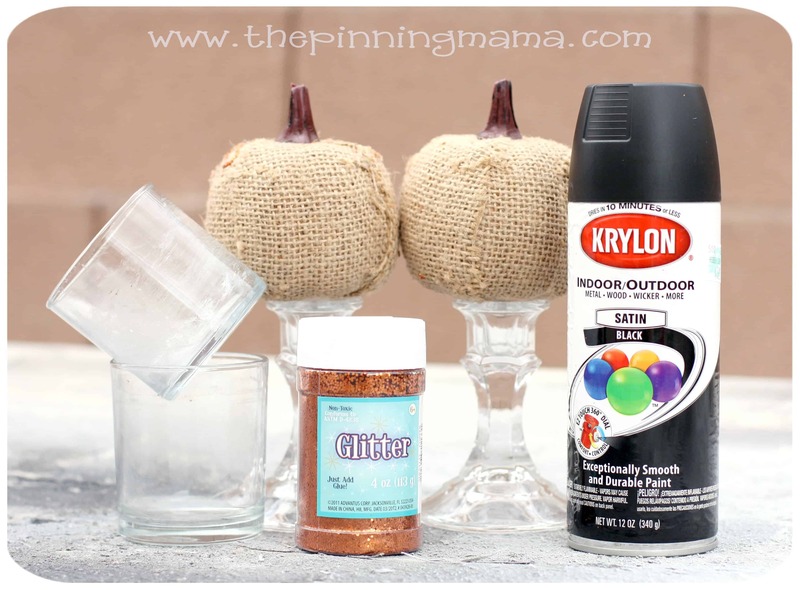 Next you’ll cover your pumpkins in mod podge or glue. 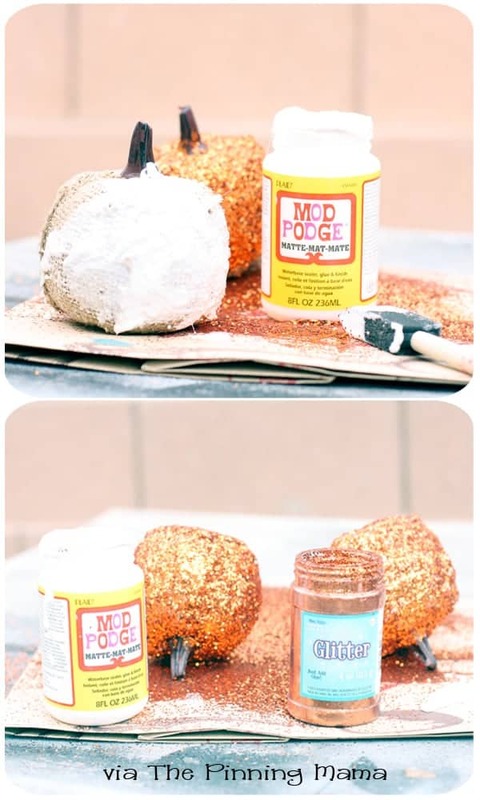 Then dump your glitter onto the pumpkin and let it dry. I like to sit my soon-to-be-glittered items on a piece of paper so that I can dump the access glitter back into the container. Once the pumpkins have dried, hot glue them onto the candlesticks. And here’s a close up! Looking for more Halloween inspiration? Check out the ideas below! Even our BOO sign is included…. How cute!!! I can’t wait to make these! Go glitter your heart out! The ladybugs sound adorable! I did feel a little bad covering these up, but the burlap was far from perfect! I love Halloween Decor! Love the glitter pumpkins! Super cute! 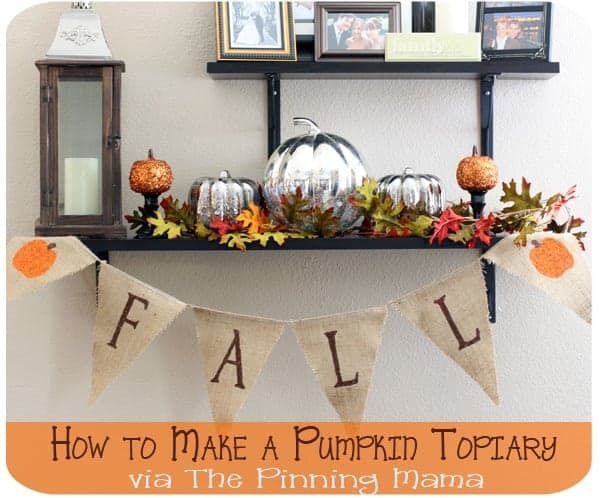 LOVE this, and I am going to the DOllar store TODAY to get some pumpkins so I can dress up my entry way. 🙂 Thanks for sharing! Gotta love the Dollar pumpkins! While I’m not a crafty person, and, I realize this is a how-to-craft post, I’ve got to tell you how much I like your shelf-vignette. It’s festive and really attractive. Plus, I like the versatility of changing it for various holidays + seasons. Aww thanks! I do love my little shelf too. Thanks for the compliments! They made my day! This looks great! And I really love how the entire look comes together – especially those shiny silver pumpkins contrasting with the burlap and glitter. Looks gorgeous! Thanks ladies! I am so happy w my vignette this year. It’s simple but still obvious what the season is. 🙂 I kind of wish I could keep the silver pumpkins out year round though! Falloween, I love it ! cute vignette and love the glittery pumpkins.